It was so amazing to me to watch all of this ordered chaos. Everyone was so patient and polite. Nobody complained. Hard to believe. Updated 2016: I could see the 2012 Easter Wonderland Parade clearly from across the hub, and at Tokyo Disneyland the hub is REALLY big. Tokyo Disneyland was seemingly built specifically for parades. The routes seem twice as large as any other park and that’s a good thing because the Japanese crowds seem to especially love them. As soon as the park opened (I kid you not) people began waiting in prime locations. 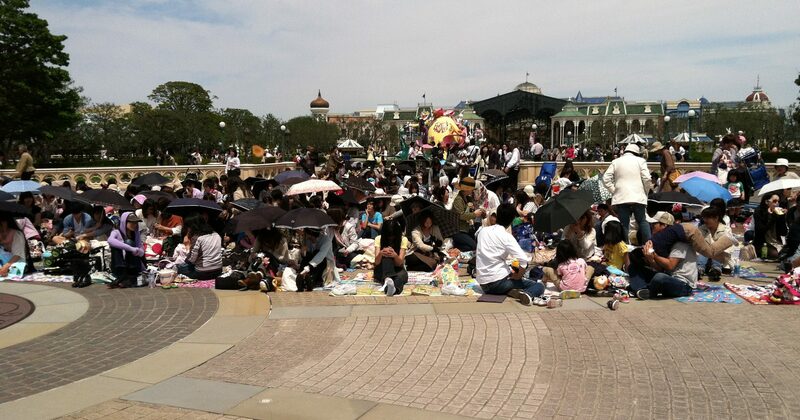 They spread out blankets, opened up umbrellas to protect themselves from the sun, and just waited super politely. By the time the parade was about to head down the pathways, there was a sea of umbrellas and blankets all up and down the route. And they have seriously awesome parades. In the Easter Wonderland Parade, the floats were big and beautiful and the dancers looked like they were anime replicas of Sailor Moon in bunny costumes. It was neat to see Oswald the Lucky Rabbit featured so prominently. It made sense. Easter. Rabbits. But it was a treat to see Tokyo Disneyland paying homage to an early Disney classic. The floats were so vibrantly colored and the different pastels were brighter than you would expect. Although it looked like a color explosion, the whole parade worked and the music was great. The opening image of Fantasmic. Notice the Sorcerers Hat in the middle that would become a focal point for the show. At Tokyo DisneySea, their parades are hosted on the water with characters passing by in floats. But the big attraction on the water is Fantasmic! Like its counterparts at other Disney theme parks, it takes place on the water and does have floats with characters passing by as well as the same rough general story. Otherwise it’s completely different. 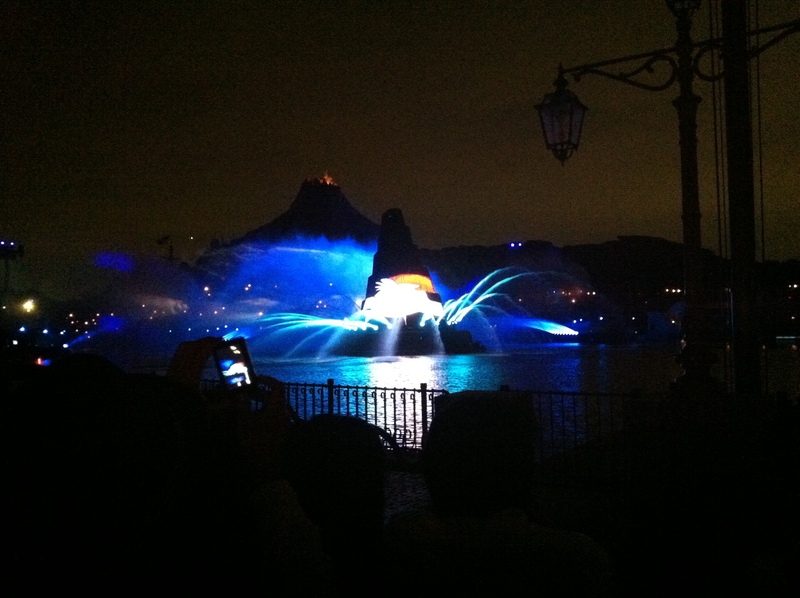 Instead of the water spray technology where images were illuminated on sheets of water, Tokyo DisneySea used more traditional image elements. There were images projected from a large conical sorcerer’s hat in the middle of the water with floats that surround and move nearby. Simba and the rest of his Lion King buddies can be seen on these moving platforms, and there is a highlighted portion for the Genie using inflatable bubbles that came out of the platforms where images were projected onto them. Missing though are elements like the snake that winds it’s way around the stage and the use of the Columbia for the finale. Still definitely worth seeing. Although people were waiting a VERY LONG time for a view of this show I was able to walk up at the last minute and still get a great spot. Unlike at US Disney theme parks, you are positioning for a better view but not to see the show at all. There are lots of great reasons to go and visit this sister park across the sea and hopefully you’ll be enticed and inspired to go and do so! For me it was a bucket list dream come true. And since then I’ve been able to share that experience with my family. I hope you will be able to also! To read about the Tokyo Disneyland Hotel and Hotel Mira Costa click here. Did most workers speak English or would it be hard for someone who only speaks English? Although most of the cast members did not speak English, I found it really easy to get around (and I barely know any Japanese). When hand gestures didn’t solve the problem, there was usually someone who could speak English nearby. Only one time in the nearly two weeks I spent there did I have trouble understanding what they wanted. So I would anticipate it really is no problem at all! Thanks for asking. What did they want in the one time you had trouble understanding? They wanted me to put my backpack on the floor of the ride! It was just a dark ride and no one was seated next to me, so I took off my backpack and put it on the seat next to me, but they wanted me to put it on the floor. Pretty soon I had two people making bowing gestures to me and I had no idea what they were doing, but I figured out later they were motioning for me to put the bag on the floor. It was quite funny afterward. That was the only thing I ever had trouble understanding. You can even get English audio translation for many of the shows like the Stitch Tiki Room. It’s really easy to ask for, too. I think they are used to it. If you go, I hope you’ll let us know how it went!